America’s “Mormon moment” is over, and public opinion appears to be little changed. Eight-in-ten Americans (82%) say they learned little or nothing about the Mormon religion during the presidential campaign, according to a new Pew Research Center poll. Most Americans still are unable to correctly answer basic questions about the history and sacred texts of the Mormon Church. And three-in-ten Americans continue to consider the Mormon religion a non-Christian faith, though there appears to be some warming of attitudes toward Mormonism, especially among religious groups that voted heavily for Mitt Romney in the 2012 election. These are some of the findings from a new national survey by the Pew Research Center’s Forum on Religion & Public Life, conducted Dec. 5-9, 2012, among 1,503 adults. During 2012, the public profile of The Church of Jesus Christ of Latter-day Saints (the LDS or Mormon Church) reached new heights: Romney became the first Mormon nominated for president by a major party, “The Book of Mormon” was a hit musical on Broadway, Time magazine published a story on the “Mormon moment,” and the LDS Church ran a nationwide advertising campaign to try to improve perceptions of Mormons. Romney was the subject of about twice as much religion-related media coverage as Barack Obama in the 2012 presidential campaign, according to a separate analysis by the Pew Research Center’s Project for Excellence in Journalism and the Pew Forum. During the course of the campaign, the portion of U.S. adults who are aware that Romney is a Mormon rose steadily from 39% in November 2011 to 65% after the election. But the vast majority of U.S. adults say they learned either “not very much” (32%) or “nothing at all” (50%) about the Mormon religion during the presidential campaign, according to the new Pew Research Center poll. Indeed, the poll finds that less than one-third of American adults (29%) are able to correctly answer two basic, factual questions about the history and sacred texts of the LDS Church, the same percentage that answered both of those questions correctly in 2010. In addition, the (non-Mormon) public is a bit less likely to see the Mormon religion as “very different” from their own beliefs; 61% characterize Mormonism as “very different” from their own religion, down 4 points from November 2011. A quarter of adults (25%) now say the Mormon faith has “a lot in common” with their own religion, compared with 22% in 2011. White mainline Protestants (a group that voted 54%-44% for Romney over Obama) are especially likely to have warmed up to Mormonism in the past year: roughly four-in-ten (42%) now see the Mormon religion and their own beliefs as having a lot in common, up 14 points from 28% in November 2011. 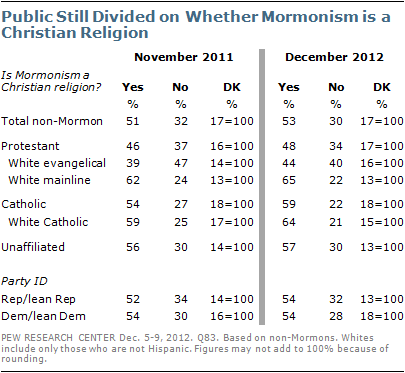 Views on whether Mormonism is a Christian faith remain unchanged, however. About half of Americans (53%) continue to say the Mormon religion is a Christian faith, while about half either say it is not a Christian faith (30%) or do not give an opinion (17%). There has been little or no change in views on this question among white evangelical Protestants, white mainline Protestants, white Catholics or other religious groups. Media coverage of Romney’s faith during the presidential campaign appears to have had little impact on public knowledge about the Mormon religion. Roughly eight-in-ten adults (82%) say they learned either “not very much” (32%) or “nothing at all” (50%) about the Mormon religion during the campaign; just 16% say they learned either “a great deal” (3%) or “some” (13%). Questions testing factual knowledge about the Mormon religion also show no significant change since 2010. About four-in-ten adults correctly answer that the Mormon religion was founded after 1800 (43%), roughly the same percentage as did so in 2010 (44%). Similarly, 43% say that Jesus Christ appeared in the Americas according to the Book of Mormon, about the same portion that gave the correct answer in 2010 (40%). The percentage who got both of these questions right was exactly the same in both years: 29%. 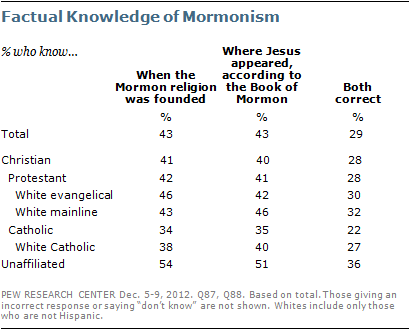 Knowledge about the Mormon religion is higher among the religiously unaffiliated than among either Protestants or Catholics. More than a third of the unaffiliated (36%) correctly answer both factual questions, as do 28% of Protestants and 22% of Catholics. There is no change in factual knowledge among religious groups, including the unaffiliated, since 2010. There is also no difference in factual knowledge about Mormonism by political party. Attitudes about Mormonism, on the other hand, appear to be softening on at least two of three indicators on the Pew Research Center survey. Compared with a year ago, U.S. adults are a bit less likely to see the Mormon faith as “very different” from their own religion, and they are more likely to mention positive terms when asked what one word best conveys their impression of the Mormon religion. 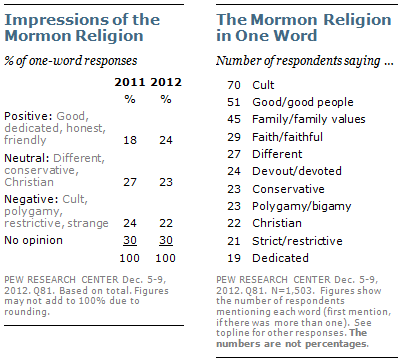 Views on whether Mormonism is a Christian religion are unchanged, however. About six-in-ten adults in the (non-Mormon) public (61%) see Mormonism as “very different” from their own faith, down from 65% in 2011; a quarter (25%) see Mormon beliefs as having a lot in common with their own beliefs, about the same as in 2011 (22%). Overall, more Protestants say their beliefs have a lot in common with Mormons’ beliefs than did so one year ago (31% today vs. 25% in 2011). 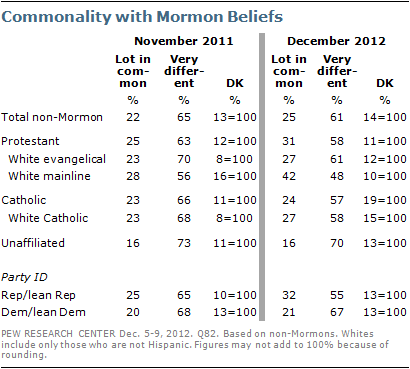 White mainline Protestants are particularly likely to see more common ground with Mormons’ beliefs; 42% of people in this group say Mormons’ beliefs have a lot in common with their own, up from 28% in 2011. Other religious groups see a less sharp distinction between their own beliefs and the Mormon religion now than they did in 2011. Among Catholics, for example, fewer say their beliefs are “very different” from Mormons’ beliefs (58% in 2012 vs. 68% in 2011), while more say they don’t know. 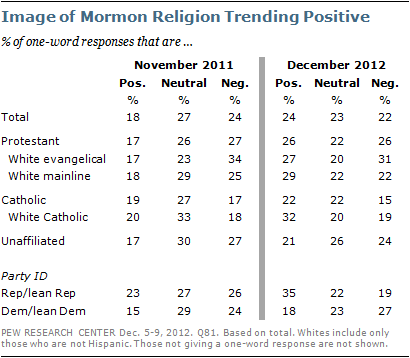 In addition, public impressions of the Mormon religion are increasingly positive. When asked in an open-ended question what one word best describes the Mormon religion, more people offer a positive descriptor than did so a year ago, though the single most common association with the Mormon religion is negative. The most commonly offered word is cult, which was given by 70 respondents in this survey, or about 5% of the public. Other common responses are positive descriptors such as good or good people (51 responses) and family or family values (45 responses). Overall, the percentage of positive descriptors is up six points, from 18% one year ago to 24% today. White Protestants (both mainline and evangelical) as well as white Catholics use more positive descriptors to describe the Mormon religion today than they did a year ago. Party identification is also related to views of Mormonism. Republicans and independents who lean Republican use more positive descriptors of the Mormon religion (35%) than do Democrats and people who lean toward the Democratic Party (18%). Further, Republicans and people who lean toward the Republican Party use more positive terms to describe the Mormon religion today than they did one year ago (35% vs. 23% in 2011). Overall impressions of Mormonism among Democrats and independents who lean Democratic are about the same. About half of U.S. adults in the (non-Mormon) general public (53%) say that Mormonism is a Christian religion, roughly the same percentage as in 2011. Views about this issue are about the same over time among all U.S. religious groups that are large enough for separate analysis. A majority of white mainline Protestants (65%), white Catholics (64%) and the unaffiliated (57%) say Mormonism is a Christian faith. By contrast, white evangelical Protestants are divided: 44% say Mormonism is a Christian faith and 40% say it is not. While white evangelical Protestants are less likely than other religious groups to see Mormonism as a Christian religion, their enthusiasm for Romney in 2012 was as strong as that of his other supporters, and they voted as heavily for Romney as they did for the GOP candidates in 2008 and 2004, according to a recent Pew Forum analysis of exit poll results. 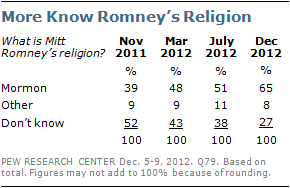 Awareness of Romney’s faith rose over the course of the 2012 campaign. Two-thirds of adults (65%) correctly identify Romney as a Mormon, up from half (51%) in July of this year and about four-in-ten (39%) one year ago. 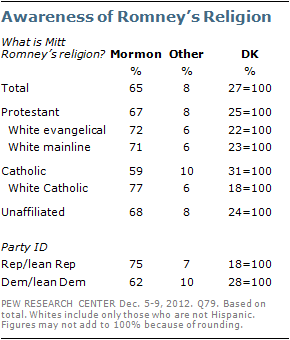 White Protestants – both mainline and evangelical – as well as white Catholics are somewhat more likely than others in the general public to know that Romney is a Mormon. Awareness of Romney’s faith also tends to be higher among Republicans and independents who lean Republican than among Democrats and independents who lean Democratic (75% vs. 62%).